Roasted pork belly with marinated shiitake and fresh hoi-sin mayonnaise on a pillow-soft steamed bun, a Chinese classic with a modern twist. Put all the ingredients in a pan and simmer on low heat. Add a whole piece of pork belly and cook it tender on low heat for about 2 to 3 hours. Let it cool down. Soak the shiitake mushrooms overnight in water. Slice the ginger and sweat in some oil. Pour the shiitake into a sieve and add to the ginger together with the oyster sauce. Add all the other ingredients and simmer on low heat until almost all the moist is evaporated. Let it cool down. Before serving, roast the whole piece of pork belly on 200C until crispy and steam the buns. 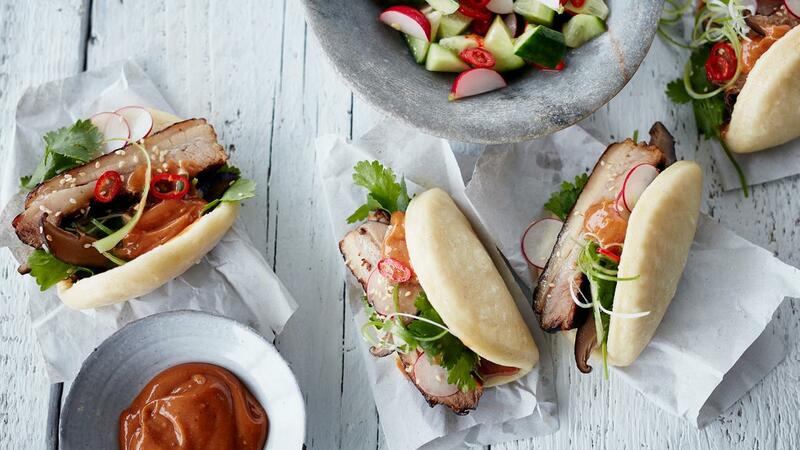 Assemble the buns with a slice of pork belly, spring onion, hoi-sin mayonnaise, radish and fresh coriander. Finish the bun with some sesame seeds and sesame oil.